Information about Minnesota Wildlife Artists from ArtBarbarians.com located in Minnesota. When it comes to making an artistic statement in your home or office, why not do something different that will give people a sense of a fine art with Minnesota wildlife artists? We suggest that you make an investment wildlife prints which will give you beauty and an increasing value over time. Many of today's best wildlife artists come from Minnesota, where the land influences people deeply. There's nothing quite like a natural scene to evoke a sense of serenity and restore a calming effect to your soul. When we exhibit Minnesota wildlife artists, we aren't so much about selling a painting as we are helping you bring some of the beauty of our native land into your interior spaces. Imagine a group of ducks coming into a stormy lake or the majestic flight of an eagle as it hunts for prey. You don't have to imagine it as we have prints from many famous Minnesota artists, the best in their genre, bringing this into your life. You'll like working with us as we are as passionate about this art form as you are. Think about areas that you may want to exhibit great wildlife pictures of the midwest, a game room, living room or maybe a dining room where it will draw the special attention of your guests. There are so many ways to incorporate these fine art pieces into your home. You may want to browse our wildlife prints and you'll find that our selection of Minnesota wildlife artists is one of the deepest on the Internet, with many artists listed here. We're adding new paintings and prints everyday, after that you may want to move onto our original paintings area which will give you an idea of the depth of the art we carry. It's exciting to be a part of an offering which brings people such a sense of satisfaction and joy. The colors, the depth, the natural settings, all of this makes this art we care about so special. We have many personal relationships with many of these Minnesota artists that we exhibit and sell, and they trust us to portray their art in a correct manner. Those relationships give us the advantage of getting you some of the best new art first, so you can add to your collection before what you want is gone. Right now, we have wonderful wildlife prints and we would like suggest a couple of artists we think you'll really like, they're part of our top ten. 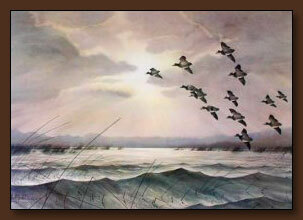 The first is Les Kouba who is considered the grandfather of all Minnesota wildlife artists, in his life, he created some of the finest examples of captured nature, such as the painting you see on this page called "Bills Arriving". The ducks are coming onto a lake just after some stormy weather. The color and realism gives you a sense of being there, it's an emotional lift! We have the many Les Kouba prints in our gallery and when you see it, you'll see why he is famous the world over for his great renderings. The second artist we have featured here is Bonnie Latham with her painting "Barn Owl II". It's a picture of a owl in a natural posing and you really get the feel of the feathers and fluff of this wonderful creature. The colors of the bird are outstanding as if you were there seeing it in the wild. But these artists aren't just about a realistic effect, the prints and paintings have a feeling which draws you in and brings out something deeper within ourselves. If you've ever lived in the north country, you know wonderful it is to see these great birds in the wild, but rarely do you see them. So wouldn't it be great to have a Latham original or print which reminds you of these natural gifts? This would be a great addition to any collection of fine art originals or prints.